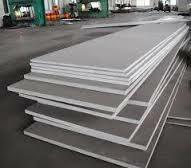 Emerged as an eminent Supplier, we are well-known for dispatching the comprehensive range of Stainless Steel Plates. As we ensure complete safety of the products at our end, we follow stringent and organized warehousing system in our state-of-the-art warehouse. Moreover, the system is supervised by experts. Our Stainless Steel Plates have a galvanized surface which provides excellent heat, chemical and rust resistance.